Extra Specifications: New. 3 Year Manufacturers warranty. BRL Test is your authorized Empower distributer. The Empower RF System 2170 Intellegent Amplifier (BBS4A6AUT ) is an L and S band microwave power amplifier suitable for multi-octave bandwidth high power CW, modulated, and pulse applications. This amplifier utilizes high power GaN devices that provide wide frequency response, high gain, high peak power capability, and low distortions. Exceptional performance, long-term reliability and high efficiency are achieved by employing advanced broadband RF matching networks and combining techniques, EMI/RFI filters, and all qualified components. 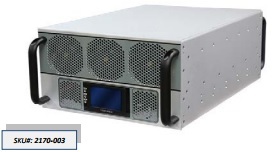 The amplifier is constructed within one single 5RU drawer including the forced air-cooling. The system comes standard to operate from a three phase 208VAC line-to-line or optionally single phase 180-260VAC supply. The model 2170 is an ideal replacement for the common 500 watt and 1Kw 1Ghz to 2.5 Ghz TWT and is more reliable, has a longer life, better harmonic distortion, comparable in weight and size, and less expensive than the now obsolete TWTA in that band. What is an Intelligent Amplifier? Automatic Level Control (ALC) - when input signal varies, maintains user defined output without clipping. Manual Gain Control (MGC) is the output power mode found in your typical high power RF amplifier. The amp is run in an open loop mode where the output power vs frequency changes due to device non linearities and variations of temperature. With this mode you can take advantage of the gain peaks to get the most output power available if your working in the associated frequency range. 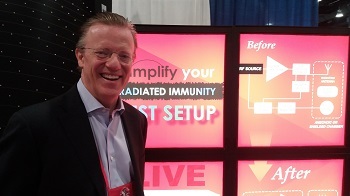 Jon Jacocks explains how Empower amplifiers have disrupted the traditional radiated immunity set up by replacing it with a simple and elegant setup design. At the 2017 EMC SIPI symposium Washington DC with Thomas Stacy of BRL Test. BRL Test and Empower are working hand in hand to bring you the best amplifiers at the lowest possible price. Contact us for other available options.